Documentary-making sits somewhere between fiction and truth. A doc is not a sheer reflection of reality, because such feature is impossible. The eye of the documentarist is always somewhere in the middle distorting reality, regardless of how impartial and distant the filmmaker endeavours to be. In Risk, American director Laura Poitras attempts to remain equitable and detached from her subject, but she soon realises that this isn’t feasible. The Academy Award winning director of Citizenfour (2014), a documentary concerning Edward Snowden and the NSA spying scandal, returns to the subject of information activism, this time focusing on Wikileaks founder Julian Assange and his associates Jacob Appelbaum and Sarah Harrison. The film follows the footsteps of the Australian computer programmer from 2006 to present days. Poitras first approached Wikileaks in 2010, meaning that the earlier footage (between 2006 and 2010) wasn’t made by her. The film captures some very powerful moments, such as when Assange calls Hillary Clinton in order to warn her about a major impending leak, or when Appelbaum confronts the Egyptian government on the subject of censorship in the middle of a very tense press conference (pre-Arab Spring, still under Mubarak). 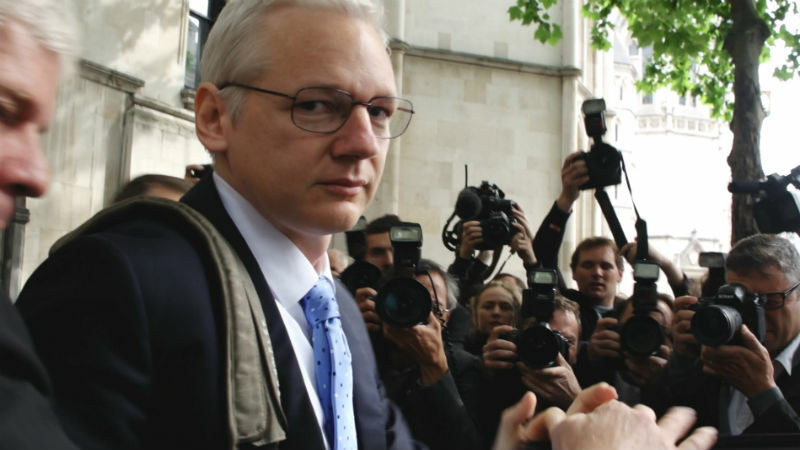 This is a real inside’s view into the dangerous world of Wikileaks. A bumpy ride without seat belt. If this was a espionage film, it would come across as too absurd and implausible. An international fugitive being harboured in a small embassy for years, his shaving cream and deodorant on bookshelves, a pop star called Lady Gaga shows up one day in order to conduct an interview, while a whole police battalion keeps guard outside 24×7. There’s even Assange disguising himself by dying his hair and wearing contact lenses (pictured below) in order to move into the Ecuadorian Embassy, thereby avoid extradition to Sweden and likely imprisonment in the US. Reality is indeed bizarre. Poitras deserves credit for providing us with valuable insight into such a dangerous and volatile environment. This insider’s view makes the film extremely engaging, but it also prevents Laura from detaching herself from the story being told. In fact, she becomes an integral part of the saga. She’s exposing the exposer, conspiring against the conspirator, or whistle-blowing the whistle-blower – whichever terminology you find most appropriate. 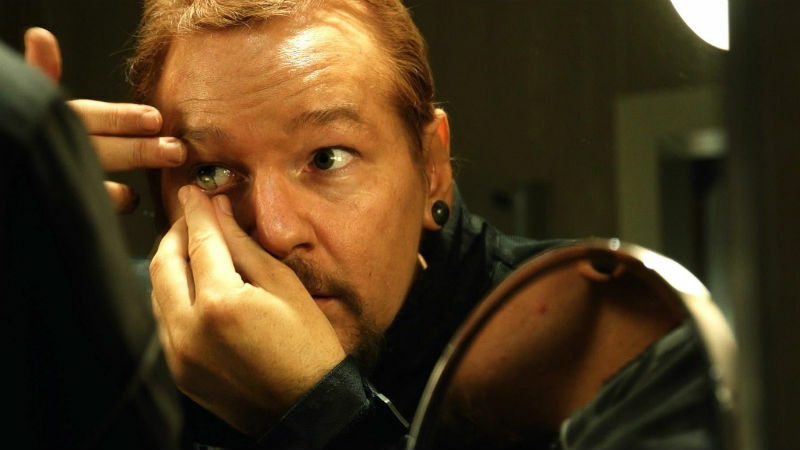 Poitras is doubly subversive in her role, and she confesses at the end of the movie that Assange wasn’t pleased with the film being released. It’s never entirely clear why he let Laura film him at all. She thinks he doesn’t even like her. Assange’s motives are very ambiguous. Ultimately, Risk is indeed a risky film. It could compromise the security of both filmmaker and the subjects of the film. Assange and Appelbaum are both accused of sexual misconduct, while Sarah could faces terrorism charges. These three controversial individuals already face a life of restrictions and possible jail sentences. Risk could work as a denunciation tool in their favour but also as an exposé of their shortcomings. It’s time you go to the cinema and decide for yourself. Risk is out in the UK on Friday, June 30th.